Of course, unless you are a Lorax, the tree is not your main character, so who cares? But in the way that writers are urged to add specifics to their descriptions (name brands, breeds of dogs) a properly defined and well-described tree can add richness and a measure of reality to a setting. There are 100,000 species of trees. This means it should be easy to go beyond oak, maple, or pine for your story. Each one of these has different characteristics, regions where it thrives, and place it grows best. 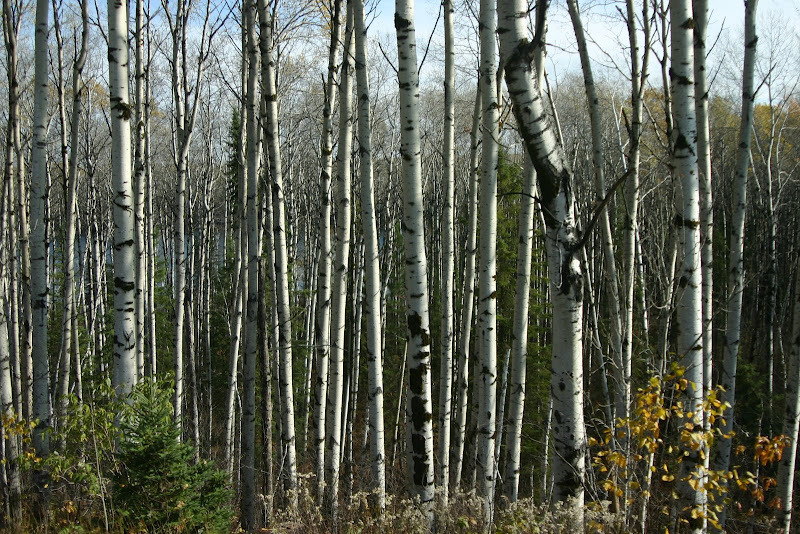 For instance, birches grow in stands of same-aged trees that have taken over open areas. 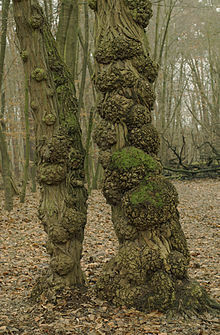 They are one of the first trees to colonize areas that have been scorched by fire or heavily logged. Cottonwood trees grow along streams and rivers in order to survive prairie fires. The tree gets its name from the fluffy white seeds that blow all over. These settle in the water and some wash ashore and take hold as new trees. Did you know that when Achilles kills Eetion during the Trojan War, the Mountain Nymphs planted elms on his tomb? 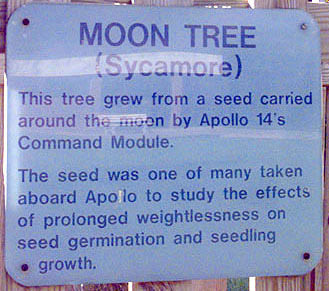 And in 1971, Apollo XIV astronaut Stuart “Smoky” Roosa, a former smoke jumper for the US Forest Service, carried the seeds of several species of tree, including the American Sycamore, to the moon to honor the USFS. Today the trees planted from those seeds, known as the Moon Trees, thrive in cities across the US. Several species of truffles have symbiotic relationships with oak trees. Trees have a specific lifespan. If your story has soldiers camping in a 100 year old stand of birches, you would be mistaken. Birches only live 30-40 years. 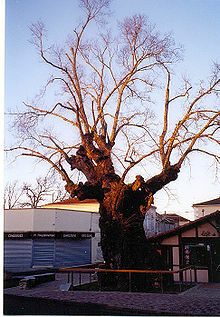 On the other hand, The Biscarrosse Elm, a field elm (Ulmus minor), reputedly planted in 1350, died of Dutch Elm disease in 2010. Lifespan of common Canadian trees in urban settings. Each species of tree is genetically determined to grow to a specific size at a predictable growth rate. Therefore, a writer can’t just toss out sentences like, “The 50 year old maple was so huge, that the three children couldn’t get their arms around it.” That may not be true for maples. So how do you figure out a tree’s age as it relates to size? 3. Find the Growth Factor for your species of tree using the table here for common North American trees. For the fiction writer, this formula probably works better in reverse. 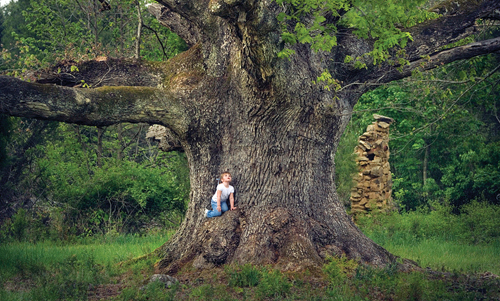 Imagine a story where the grandfather planted a red oak tree 50 years ago. How big around would the trunk be today? Apple trees do not work the way many people think. Yes, you can plant an apple seed and, after some years, you will end up with an apple tree and fruit. But here’s the thing: Due to a trick of genetics you will not end up with the same kind of apple you planted. In fact, you will end up with a never-before grown kind of apple that may or may not taste very good. When you see an endless orchard of Golden Delicious apples, these were not grown from Golden Delicious seeds. Every tree in that orchard came from a shoot (or “scion”) from an existing Golden Delicious tree that was grafted onto rootstock. Today, if you buy an apple tree, it consists of both parts – the scion, which determines the type of fruit you get, and the rootstock which determines the maximum size of the tree (and thus, years to fruit production). The rootstock may also provide some resistance to specific pests or environmental stressors. 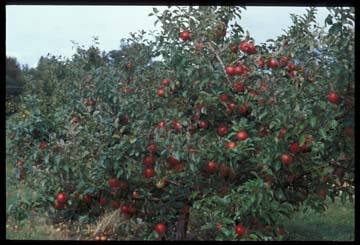 The choice of root stock allows orchard owners to select the stock that best suits their environment while still producing the type of apple they want. Then where do new kinds of apple come from? Since every apple seed planted creates a new kind of apple, experimental cultivators plant many seeds hoping that one will result in the next consumer favorite. University of Minnesota’s Horticulture Experiment Station, cultivator of the immensely popular Honeycrisp (TM)* apple, is one such place. *Names of new apples are trademarked by their cultivators. Kim, I love your Friday Fiction Facts. Chock-full of handy information. Bits from last week’s piece on horses and this post on trees will be finding a place in my novel. Thanks for filling in the blanks in my knowledge that I didn’t know existed. You are my new research assistant. Thanks Heather! I plan to go out tomorrow and measure a tree. There is a huge maple near us that must be ancient. As I recall, there is a place to register ancient trees in Ontario. Will have to look that up.